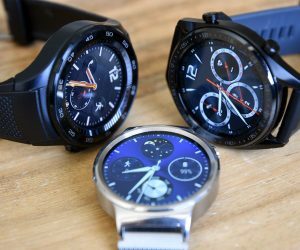 The Samsung Galaxy S4 and HTC One are sure to be two of this year’s hottest handsets, and many buyers will be faced with a decision between the two. With both devices on hand, it seemed like a no-brainer to pit the phones head-to-head in an effort to decide which is really the better buy. 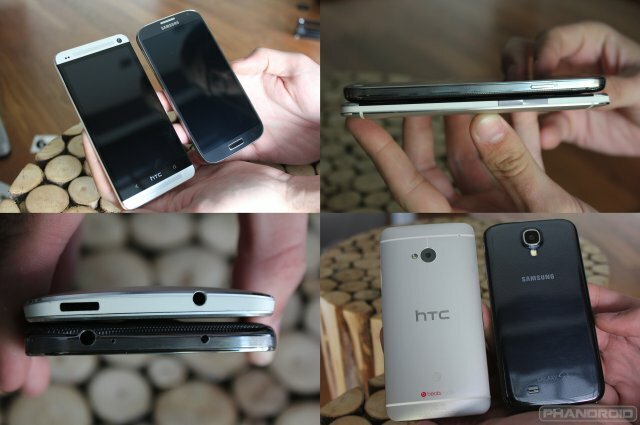 If you want more in-depth coverage of each handset, check out our full Galaxy S4 review and HTC One review. 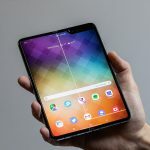 What follows here is a quick look at the key points of comparison, but deciding which device holds the edge wasn’t always easy. The Samsung Galaxy S4 and HTC One are both marvels of engineering, cramming a host of high-powered hardware into smartphone shells that continue to get thinner, lighter, and more durable. Despite a larger 5-inch display, the Galaxy S4 actually manages to come in smaller in most areas than the One with its 4.7-inch screen. The Galaxy S4 measures 5.38 x 2.75 x 0.31 inches, while the One measures 5.41 x 2.69 x 0.37 in. The S4 is lighter at 4.59 ounces, while the One weighs a hair over 5 ounces. Overall, however, device size is a wash. You won’t notice the extra tenths of an inch or the half ounce weight difference. 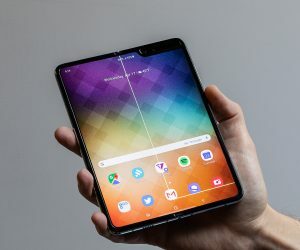 Where the two devices really differ is in the quality of build. Samsung decided to stick with a design close to last year’s Galaxy S3, and the result seems a bit lazy. HTC’s engineers, however, put in some real man hours in designing the One, even coming up with new manufacturing techniques along the way. 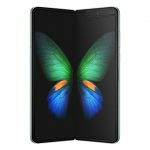 Samsung continues to stick with plastic as the main build material for their premium smartphones. While it does afford certain benefits like a removable battery and the ability to attach a flip cover, the handset feels a bit cheap. The One however, feels like a solid, well-built piece of tech. Gapless unibody construction utilizing metal as the main material makes the phone as much a joy to look at and hold in the hand as it is to use. Both the Samsung Galaxy S4 and HTC One feature displays pushing Full HD 1920 x 1080p resolution, though they vary in size and technology. The Galaxy S4 sports a 5-inch Super AMOLED display. At 1080p resolution, it’s a first of its kind. The One carries a 4.7-inch Super LCD3. Both are capable of reproducing 16 million colors, and both gain durability via Gorilla Glass construction (Gorilla Glass 2 on the One and Gorilla Glass 3 on the GS4). Due to the smaller screen size, the One features a higher Pixel density of 469 ppi compared to the 441 ppi found on the Galaxy S4. In a head-to-head comparison, deciding which phone got the edge was difficult. 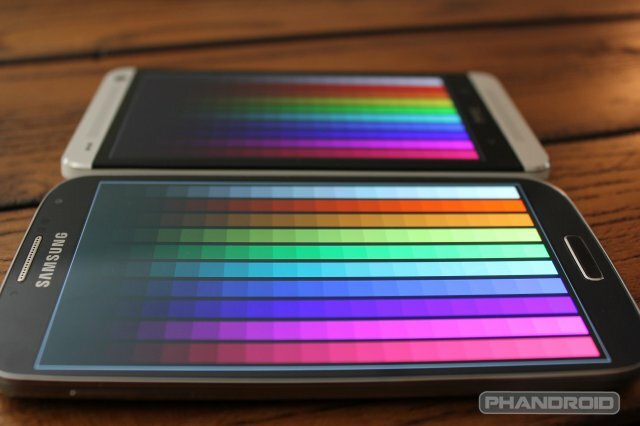 At full brightness the Galaxy S4’s Super AMOLED display offered a richness of color and contrast, while the HTC One looked a tad bit washed out. Color reproduction was slightly different between the two, most noticeable in the green spectrum. The HTC One seemed a bit truer to life, but the Galaxy S4 did a better job of reproducing darker shades. The Samsung Galaxy S4 runs Android 4.2.2. The HTC One comes with a slightly older version, Android 4.1.2. But each features its own proprietary user interface on top of Google’s Jelly Bean platform. For the Galaxy S4, that’s Samsung’s TouchWiz. For the One, HTC Sense 5. Both feature some major upgrades over older versions of the same software. 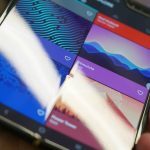 For the Galaxy S4, this includes some new hands-free user input methods as well as a smattering of updated apps, including the newly consolidated Samsung Hub content ecosystem for purchasing music, books, video and more. Samsung has always favored a slightly cartoony, bubbly appearance for its UI, and it remains that way with the GS4. Sense 5 also features its fair share of updates, including an overhauled homescreen interface, a revamped gallery showcasing your pictures and videos in beautiful fashion (though a bit confusing and clunk at times), and an improved keyboard. HTC has really slimmed down Sense in this case, but it looks as sleek and stunning as ever. Both gain universal remote functionality by way of built-in infrared blasters and new TV guide software. Samsung’s WatchOn and HTC’s TV app give you a view at what’s currently playing, offer recommendations, and allow you to easily control your home theater setup right from your smartphone. You’ll never lose the remote again. The intricacies of each platform make it nearly impossible to compare both directly, as this portion mostly comes down to user preference. 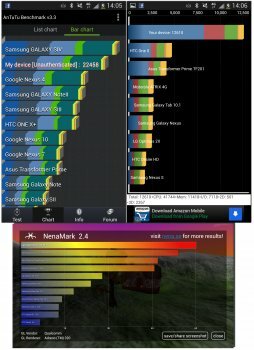 For a more in-depth look at what to expect from each, check out the software section of our full HTC One and Samsung Galaxy S4 reviews. As has been the case with most recent HTC phones, audio is highlighted on the One. With Beats integration and new BoomSound dual-front facing speakers. For Samsung, audio is less of a focus, but they have introduced Group Play music, which turns a hoard of Gs4 handset into a roving sound system. 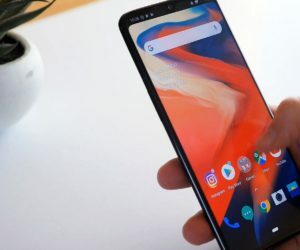 But it’s hard to argue with what HTC has done, bringing a true stereo audio experience to a smartphone and giving users the option to enhance said audio with Beats technology. To get a stereo experience with the Galaxy S4, you will need multiple devices, and that won’t always be an option in most cases. Samsung and HTC have really upped the ante with the cameras featured in the Galaxy S4 and One. 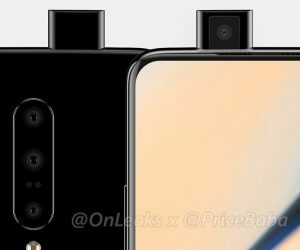 Samsung deploys a 13MP sensor with LED flash capable of capturing 1080p video, while HTC has gone a more innovative route and introduced us to the first “UltraPixel” camera. That camera stacks a set of 4MP sensors on top of each other, stitching together a final result that is touted as providing better low-light shooting and greater depth of color and contrast. In real-world testing, the Galaxy S4 outperformed the HTC One in outdoor, daylight conditions. The One, however, had a better handle on low-light and indoor situations. In terms of video, it’s a toss up. Both cameras offer image stabilization, but each had its flaws. The One’s stabilization is always-on, but it didn’t make a huge difference in our test videos. Samsung allows the feature to be toggled with the S4, but again, it didn’t produce a huge difference in video quality. Both cameras offer various shooting modes, filters, and more. 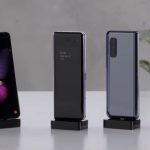 HTC introduced its Zoe motion images with the One, while Samsung brings new features like dual-camera shooting (front and rear camera at the same time) and Eraser mode for removing unwanted subjects from photos automatically. In the end, the Galaxy S4 offered a more robust software experience, but it was hard to determine the true winner in terms of picture quality. Both the HTC One and Samsung Galaxy S4 come in several different storage options. The One is available with either 32GB or 64GB of internal storage, while the Galaxy S4 comes in 16GB, 32GB, and 64GB flavors. The Galaxy S4, however, can gain an additional 64GB of storage via a microSD card. The One offers no support for expandable memory. In an ideal world, all options would be available to all consumers, but unfortunately this is not the case. Depending on carrier considerations or whether or not the device is unlocked, users may have to settle for less storage than would be ideal. This makes the expandable storage of the Galaxy S4 an appealing choice for some. The quad-core Qualcomm Snapdragon 600 was at the heart of both devices we tested. The Galaxy S4 is available in some regions with Samsung’s new Exynos 5 Octa chipset, but for the sake of this comparison we will leave that version of the device out. 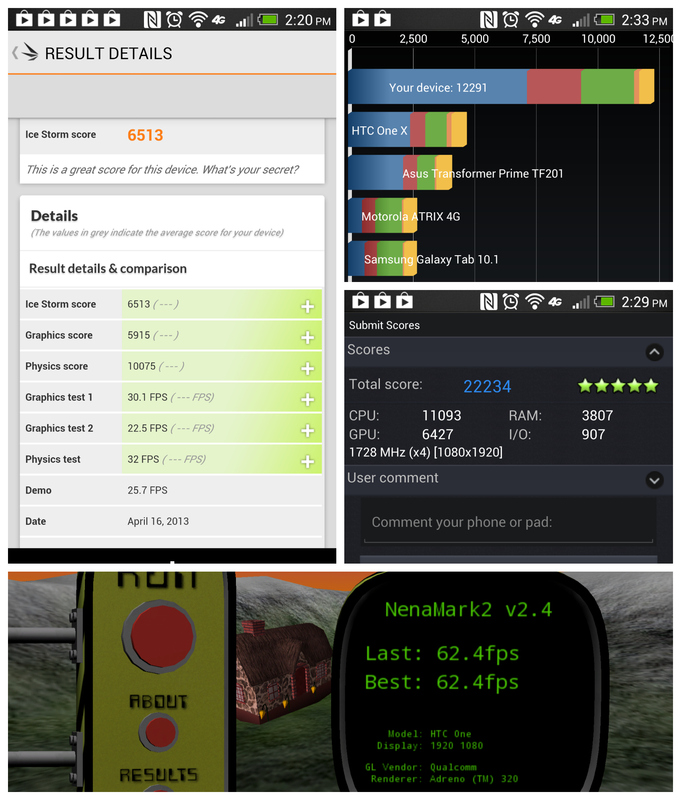 The One’s CPU is clocked at 1.7GHz, while the GS4 is turned up to the max at 1.9GHz. As expected, the benchmarks were neck-and-neck. 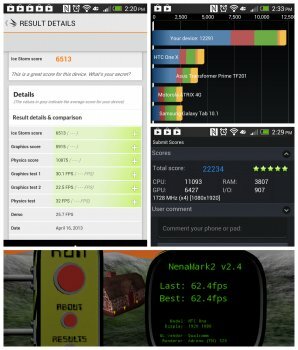 Running multiple tests on several benchmarking apps available from the Google Play Store (including AnTuTu, Quadrant, and NeneMark 2), there was no clear-cut winner. Sometimes the Galaxy S4 [results above] forged ahead, others the One (despite its lower clock speed)[results below]. What the tests say to us is that you can’t go wrong with the performance either phone affords. Both the Samsung Galaxy S4 and HTC One feature sizable batteries that should power through a normal day’s use with no problem. The Galaxy S4 has a slightly chunkier power cell at 2,600 mAh while the HTC One comes in at 2,300 mAh. The GS4 features a removable batter, while the One’s battery is sealed within the device. In normal testing, both were able to squeeze out 10-16 hours of use. Of course, taking full advantage of all the features available on both devices ultimately leads to a dramatic reduction in up time. 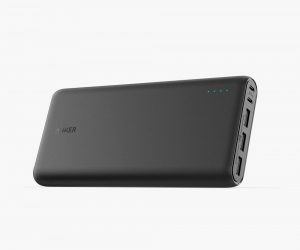 For those doing a lot of gaming, streaming, web browsing, etc., battery power can quickly drain. But that sort of binging isn’t the typical daily use for most people. While the Galaxy S4 ekes out a few extra minutes of power overall, both are perfectly capable of taking you from waking up in the morning to passing out at night without the need to seek a charger. The GS4 gets kudos for its removable battery (for those that like to carry a spare). 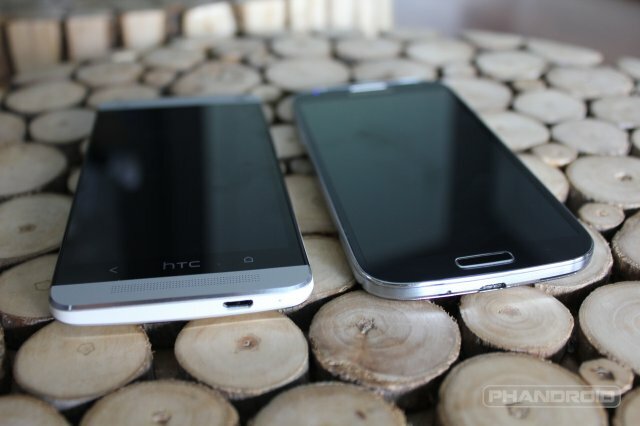 In the end, you can’t go wrong when choosing between the HTC One and Samsung Galaxy S4. Any number of the above categories could have resulted in a tie, and many will come down to personal preference. On top of that, all categories aren’t necessarily equal for each buyer, nor is it a cut-and-dry decision when it comes down to things like software. For someone seeking the sleekest combination of power and beauty, the HTC One is the way to go. If a big, bright and beautiful display along with innovative user interface options is your thing, look no further than the Galaxy S4. But which is the choice for you? Sound off in our poll below to decide the real winner!